Over the last year, the Pacific Electric class C-30-2 caboose has become an obsession of mine. Considering how much data is out there on the different interurbans and streetcars, I am always surprised at the lack of information there is on the freight equipment. What I am putting on this page is more data than I have found ANYWHERE online or published in books. 1900, San Bernardino. April 19, 1942. 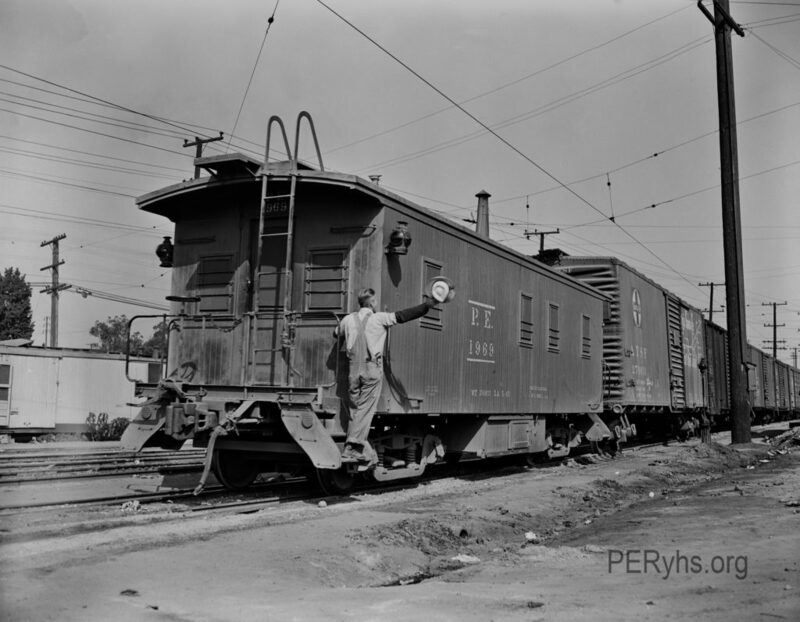 In the late 1930’s, the Pacific Electric was using a mixed bag of bobber caboose, home made caboose, and converted boxcars. 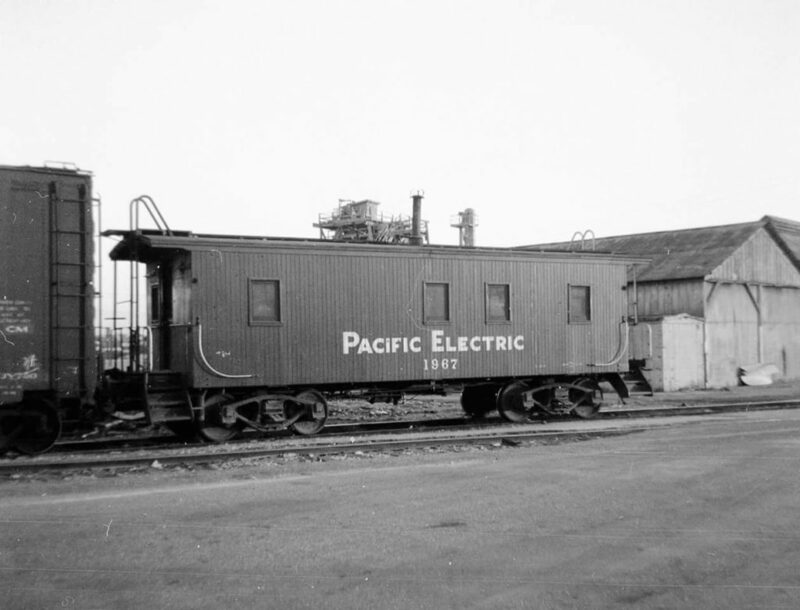 As the equipment aged, the Pacific Electric started to look for a replacement. Instead of trying to reinvent the wheel, the Pacific Electric looked at it’s parent road, the Southern Pacific as a source of inspiration. The Southern Pacific had a huge fleet of C-30-1 and C-30-2 caboose that worked great for them. 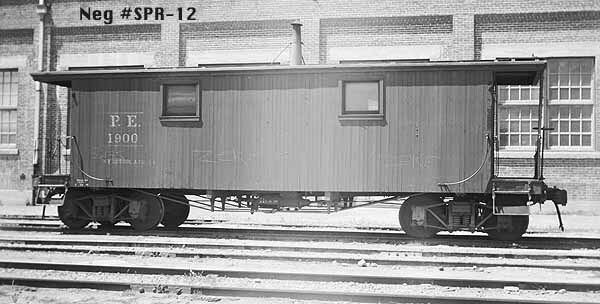 The Pacific Electric decided to build ten caboose based off of the C-30-2, and they were exact copies, minus the cupola. Donald Duke collection / Golden West Books . 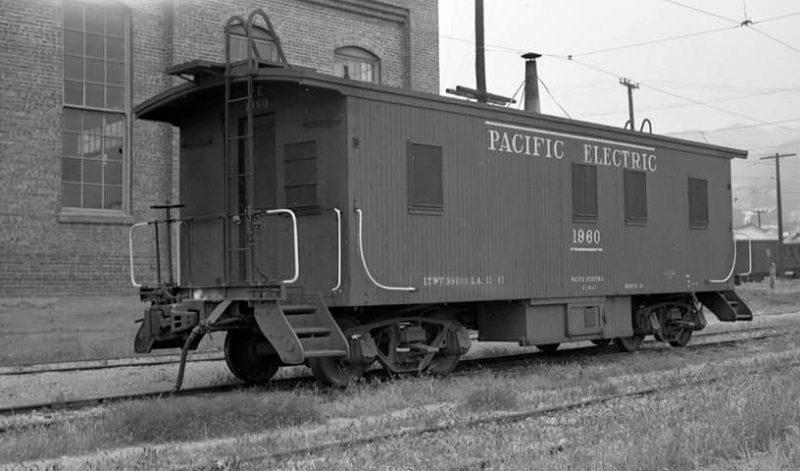 The Pacific Electric C-30-2 were built in 1938 and 1939, numbered between 1960 and 1969. 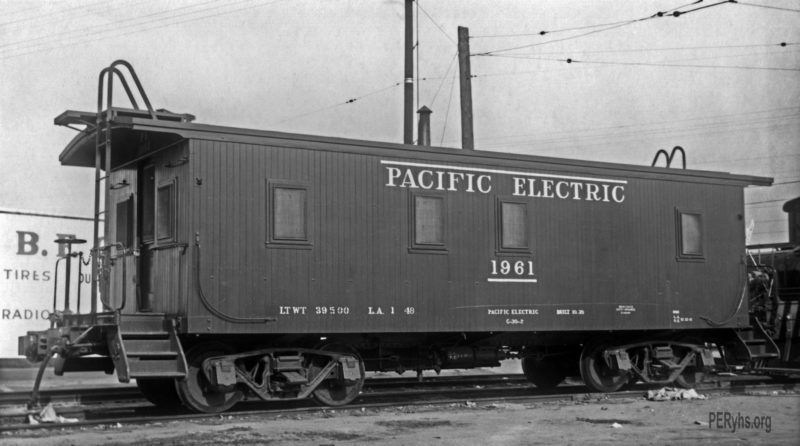 When they were built, the Pacific Electric followed the lettering standard of the Southern Pacific, using just the initials and the number for identification. 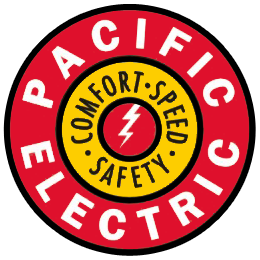 The Southern Pacific used this style of lettering until 1946, I do not know when the Pacific Electric changed. 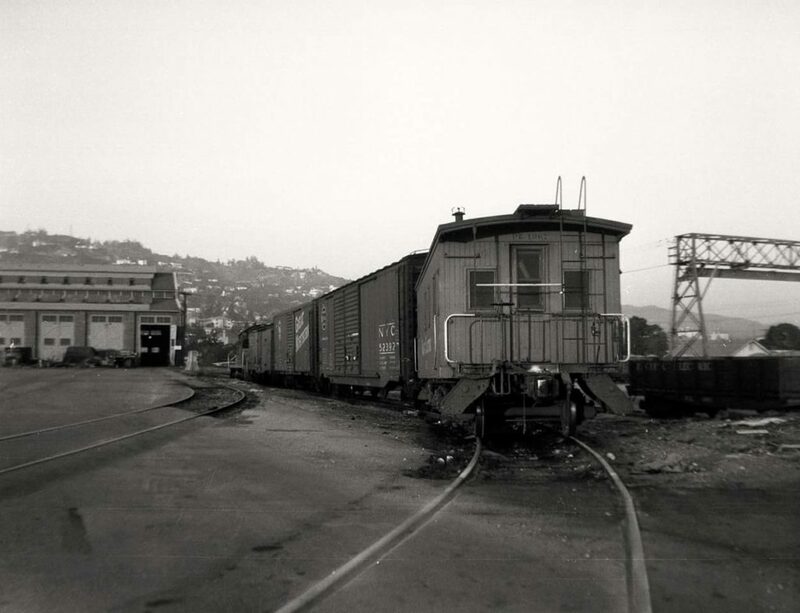 Image scanned from a 4 x 7.5 inch print from the Paul Koehler Pacific Electric collection. The above picture from 1948 is a great source of information. It shows that the Pacific Electric followed the Southern Pacific in spelling out the full road name, and it clearly shows the data that modelers look for. This is my favorite picture of a Pacific Electric C-30-2 that I have seen. Image Notation: Scanned from a color transparency with Bessler slide duping machine. 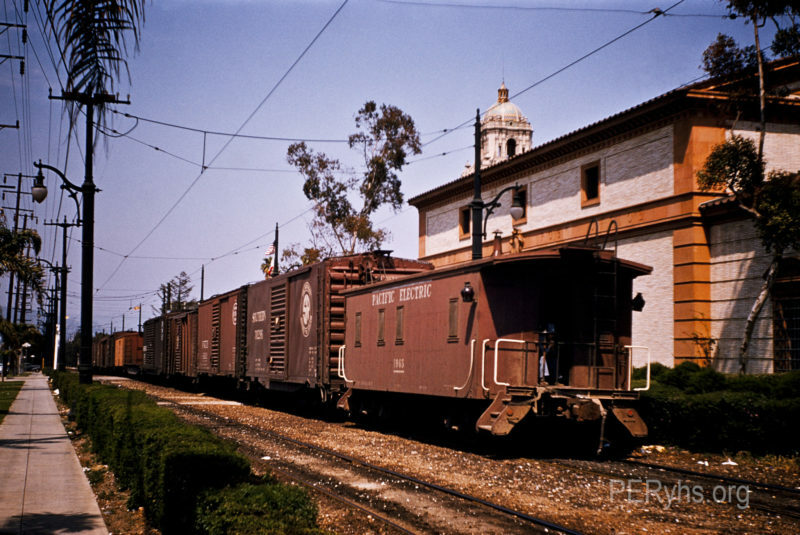 Starting in 1948, the Southern Pacific began painting the hand rails on their caboose white, the Pacific Electric followed suit. Unfortunately, the date when the Pacific Electric did so has apparently been lost to time, yet if you want to know the exact date that a PCC car ran to Santa Monica….. The final paint scheme of the flat tops was again a copy of the Southern Pacific. 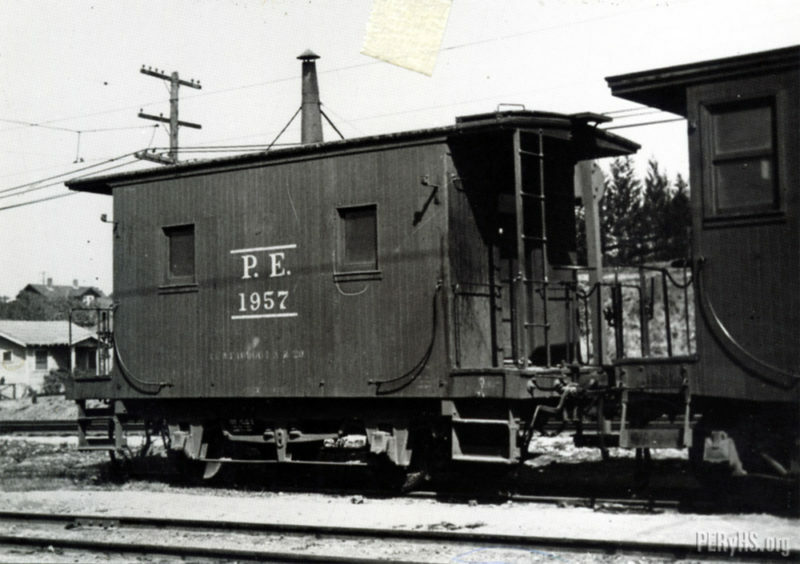 The SP changed both the lettering and the paint scheme in 1955, and I have not been able to track down an exact date that the Pacific Electric started to paint their caboose this way. These cars were painted in the traditional boxcar red, except the ends were painted in Daylight Orange. The Billboard style lettering is the only time that the road name was applied below the windows. I have seen images stating that these cars were in use as late as 1962, however they could have lasted until the merger of 1965.